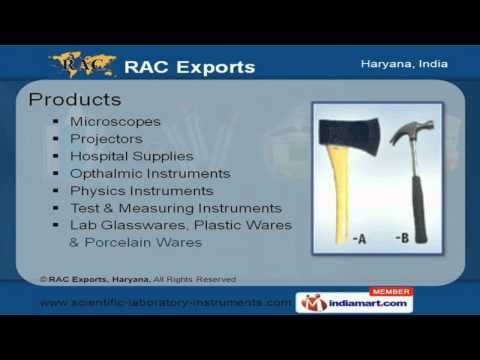 Welcome to RAC Exports, HaryanaSeasoned exporter of Scientific & Lab instrumentsWe are an ISO 9001:2000 certified company, established in the year 2004. Our sophisticated manufacturing unit & capacious warehouses has helped us to gain the present repute in the industry. Timeliness, efficient network, competitive pricing & dedicated team of professionals are some of the key factors behind our success. Our product list includes Microscopes, Projectors, Analytical Laboratory Instruments, Lab Glasswares, Plastic and Porcelain Wares. We offer diverse range of Microscopes like Student, Medical, Binocular & Stereo Microscopes. Our Slide & Over head projectors are manufactured using cutting edge technology. Micro Pipettes, Weighing scales, stethoscopes, Disposable syringes & crepe bandages are some of our hospital supplies. Our exclusive array of ophthalmic instruments includes Keratometer & slit lamps. We also provide Induction coils, Tangent galvanometers, conductivity apparatus, weight boxes & optical benches.